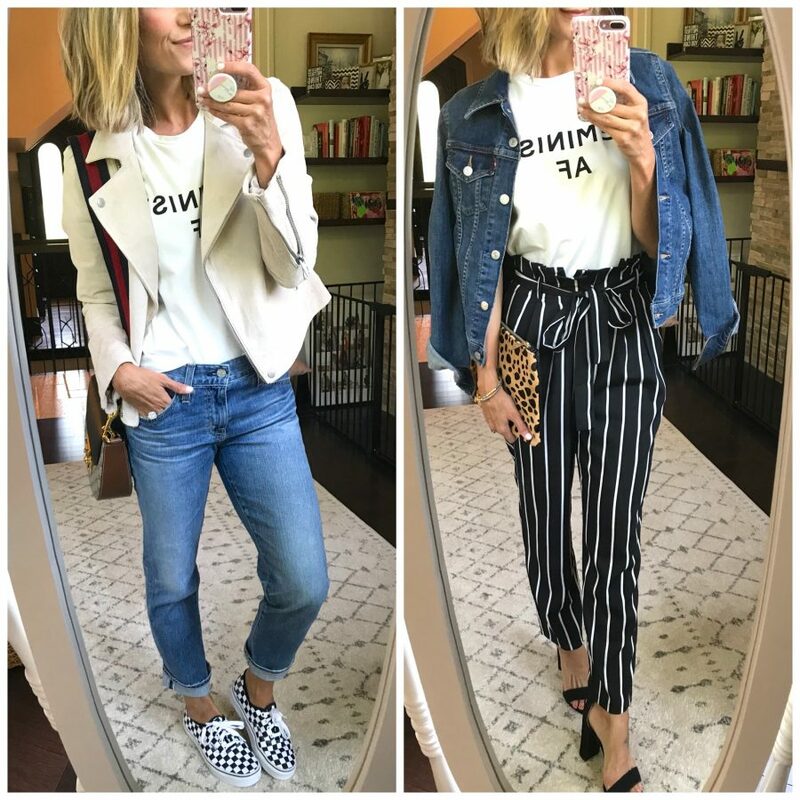 Anytime I post one of my SHEIN finds on social media, I always get asked if it’s legit. Here’s the thing: it’s hit or miss, but when you find a hit, it can be VERY cute. Let’s compare the quality of the clothes to Forever 21. It’s highly likely that half of the clothes are not worth even their low price tag. BUT. You can find some great pieces. I shared shopping tips in my last post and there’s not a whole lot to add. I would stick to the trendy pieces. Stay away from sweaters, denim and shoes. Even the shoes are only $15, it’s a waste of money. I did try a pair of sandals last time, and wasn’t surprised when I was disappointed. When choosing which size to order, look at the measurements instead of the size. It’s more accurate. Choose darker colors over lighter colors. They tend to look less cheap and wear better over time. Overall, this was my favorite haul yet. I think I’m getting the hang of it. Also, it was my fastest order. I received it all in one delivery within a week. Last time it took longer, and the pieces trickled in. I’ve linked everything I’m wearing. Most I was able to link in the widgets, but if I couldn’t it’s listed below the photo. 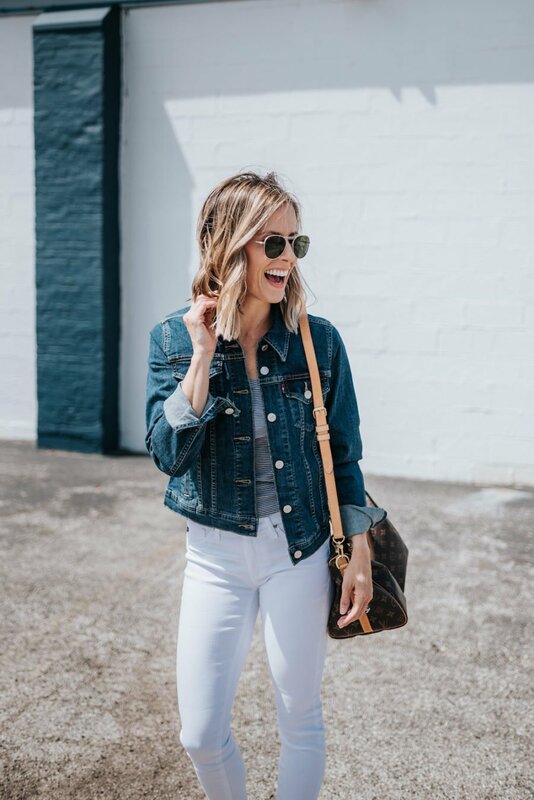 You’ll be seeing more ways to style the items below in posts this fall, so be sure to stay tuned! I’d love to hear your thoughts! 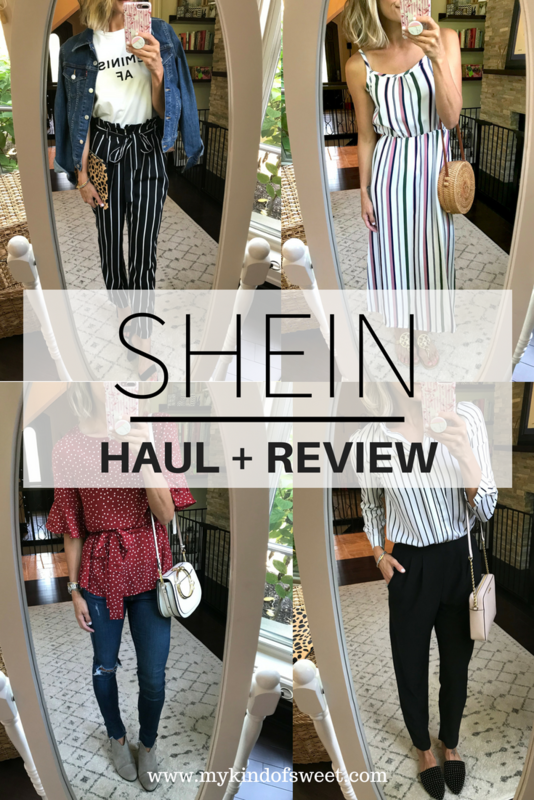 Have you ordered from SHEIN before? Have you been pleasantly surprised or disappointed? Let me know in the comments! 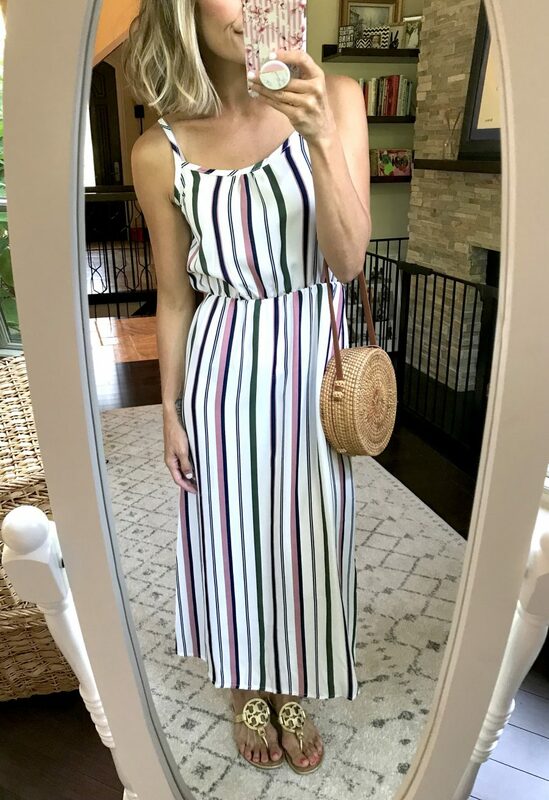 I bought this $10 maxi dress in a different pattern last winter and I knew I’d be getting another one. It’s nothing fancy, but it’s just right for a beach vacay. It comes in a ton of colors + patterns. I’m wearing a small. 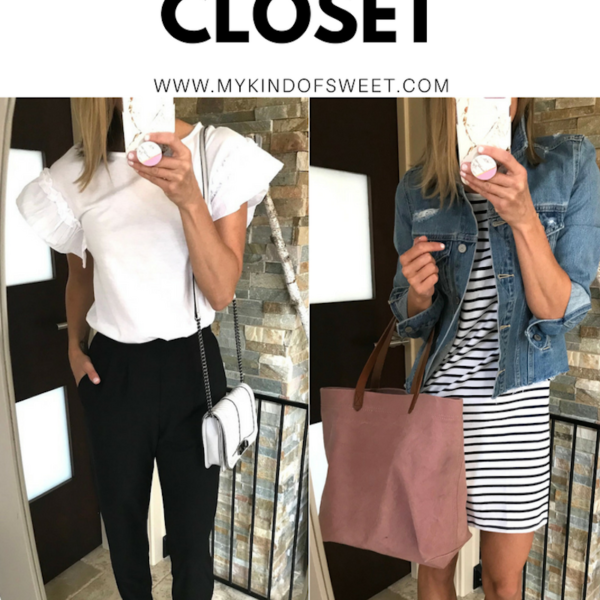 File this top under one of my favorite SHEIN finds. The color is more rust than it looks online, but if this doesn’t remind you of that gorgeous Pretty Woman polka dot ruffle dress, you might need to drop what you’re doing and go watch it, STAT. I love a tie-waist top. It’s so flattering and is perfect for covering up a food baby or a first trimester baby bump. I’m wearing size small. Normally, I would not order tees from SHEIN. It’s just not something I would trust. I want good quality tees since I wear them constantly, and I need them to hold up. 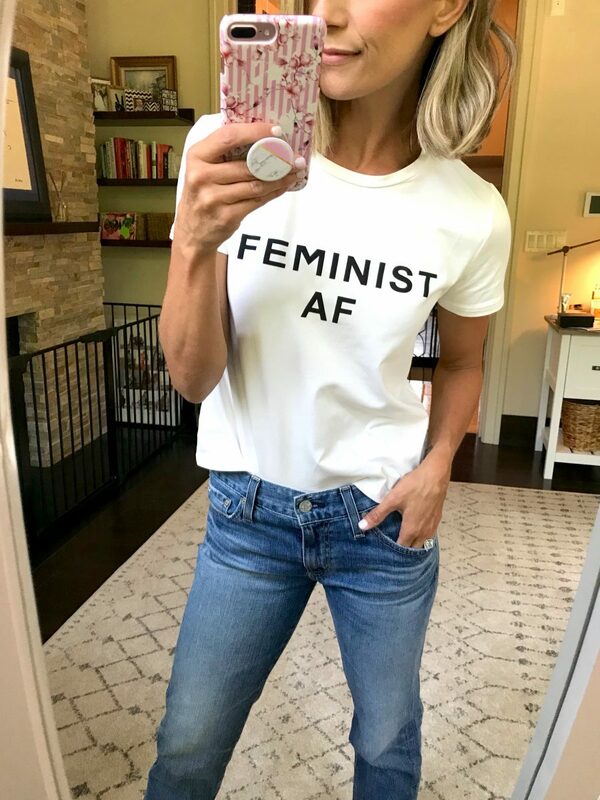 But, I can’t deny a good graphic tee and there’s not a better message in the whole world. It runs VERY small and is a bit cropped. I’m wearing a medium, and I could probably even go up a size. It’s got a lot of stretch, so it’s very comfy. It’s not see through. Day to night. Obviously I live in a tee + jeans or leggings during the day, but I also love rocking one for date night if I can pull it off. 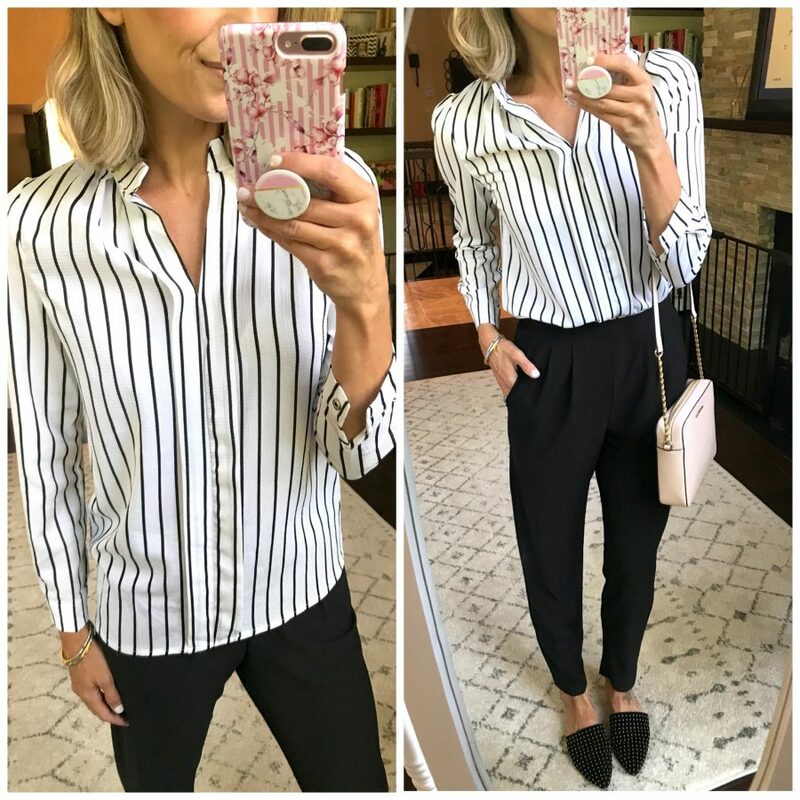 These $18 striped paperbag pants are from my last SHEIN haul last winter, and I’m still loving them. I didn’t know if I would like this trend, but I’m fully on board. I’m wearing size small. I thought this $9 top would be a perfect workwear option, and I don’t want to back myself on the back, but I’ve gotta say I was right. (However, if you are broad in the shoulders, I don’t think it’s right for you. I’m broad and it’s pulling a little bit.) I’m wearing size small. 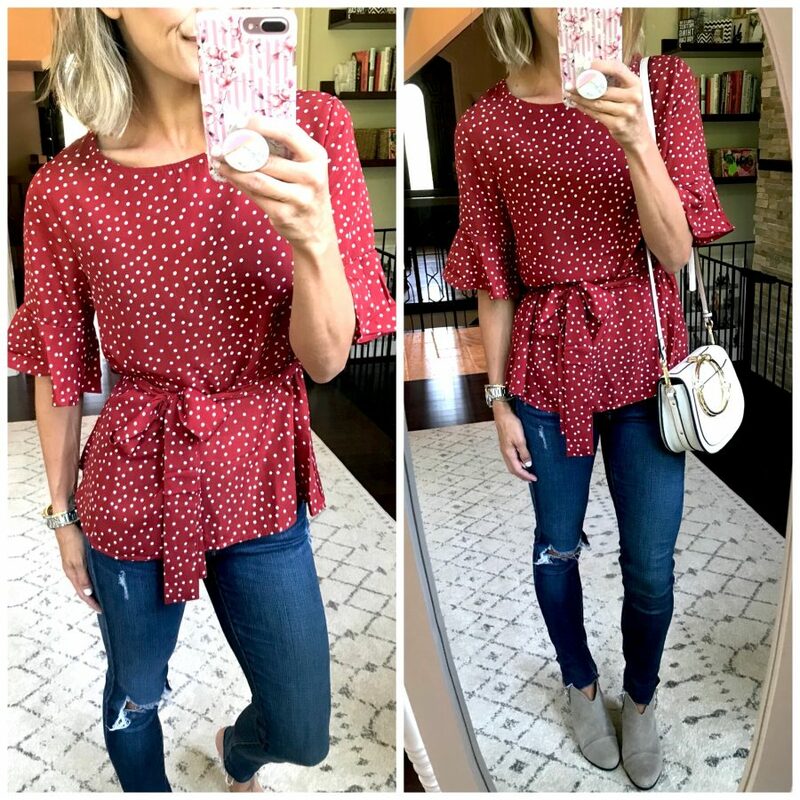 It’s almost sold out, but this top is in stock and is very similar. 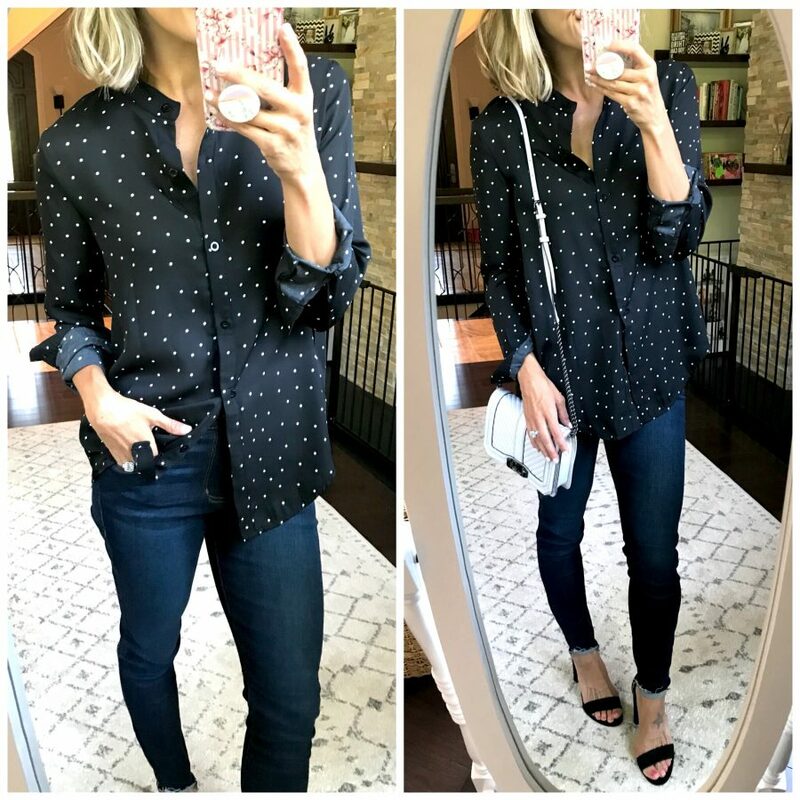 If you’re looking for a long button down that you can wear untucked (and it covers the booty), half tuck it, or tie it, this $18 polka dot button down is for you. It’s oversized, so even though I’m wearing a small, it feels more like a medium. 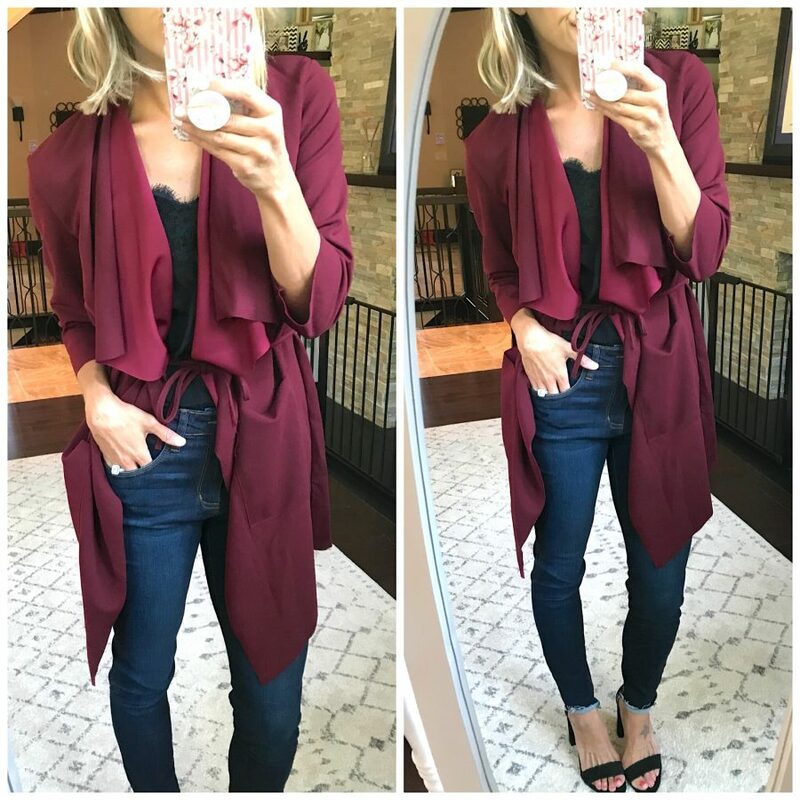 I ordered this duster in pink for my last haul, and it’s so cute I wanted to get it in this gorgeous burgundy for fall. It makes any outfit and it such an awesome piece to add to your closet. You can wear it belted or open. Wearing small.